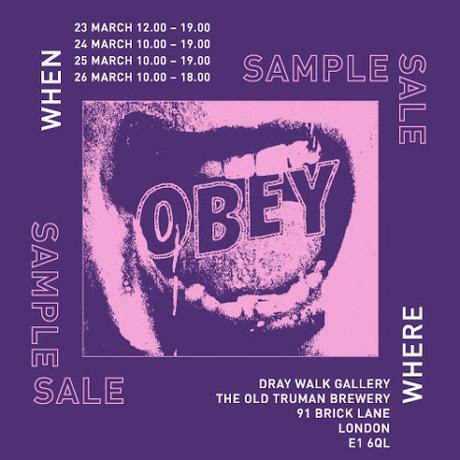 This week sees Obey Clothing roll into London’s East End for another show stopping Sample Sale; from tees to jackets and from caps to bags they will be representing their Men’s Collection and sprinkling through new exclusive styles at marked down prices. Opening on Thursday 23rd March running until the eve of Sunday 26th they will be restocking and re-upping the selection of clothing available; they'll be keeping the whole shop fresh whilst littering the rails with exclusive samples and classic vintage cuts. Obey Clothing will be in their usual spot on Brick Lane in the Old Truman Brewery so whether you’re just picking up a new tee for a present or restocking your whole wardrobe pop down and say hello! LONDON SAMPLE SALE Thursday 23rd March - Sunday 26th March 2017.